You often go to car wash stations to clean your cars. Sometimes, if you are cost cutting, you do the cleaning. 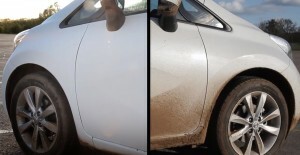 Cleaning the car is a meticulous job and it takes professionals to thoroughly clean it. What if the car has the equipment to self-clean? Yes, you heard it right. The very first ‘self-cleaning’ car has arrived. 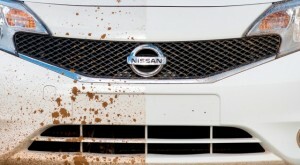 Dry technology: Nissan is the first automobile company that utilizes dry technology. 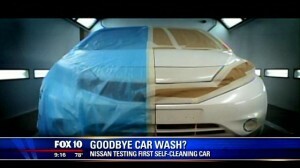 Dry technology uses the Nano-paint coating which can prevent things from sticking to the car. Dry technology can respond to various weather conditions like rain, snow, sleet and frost. The prototype test: It is the Nissan Versa Note which is used for the prototype testing. Dry technology is an add-on feature (since it can be painted). You can choose to upgrade your car or you can simply buy a new one with dry technology feature. Where it will be initially tested: In the coming months, Nissan will test it initially in Europe particularly at the European Technical Centre located in Cranfield, United Kingdom. The technology will be available to the market soon. There you go. You do not need to personally clean your car or bring it to car wash stations anymore. With this technology, life will be easier and better.